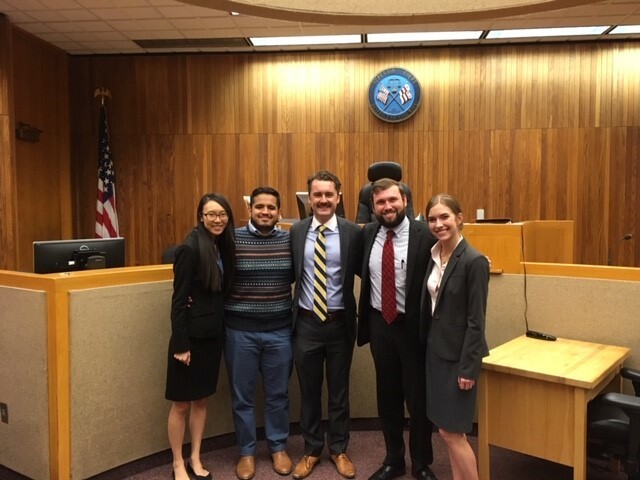 Texas Law’s nationally recognized Advocacy Program sent teams to a total of seven interscholastic mock trial and Alternative Dispute Resolution competitions this fall season. From California to New York City, students competed and achieved for the University of Texas at a level of excellence rarely matched. Read on to learn more about the competitions our students attended, team members and coaches, and individual awards won. MLK, Jr. National Civil Rights Competition hosted by UC Davis School of Law in Sacramento, CA. Team members: Bruce Baldree, Chris Forester, Karina Ochoa, Mason Pastrana (all third-year students). Individual Awards: Mason Pastrana won the tournaments Best Cross Examination award. Picture: L-R: Bruce Baldree, Chris Forester, Mason Pastrana, Karina Ochoa. Securities Dispute Resolution Triathlon hosted by St. John’s School of Law and the Financial Industry Regulatory Authority (FINRA). Took place at St. John’s School of Law Manhattan Campus in New York. The Triathlon is the first and only competition to include negotiation, mediation, advocacy, and arbitration in a single event. 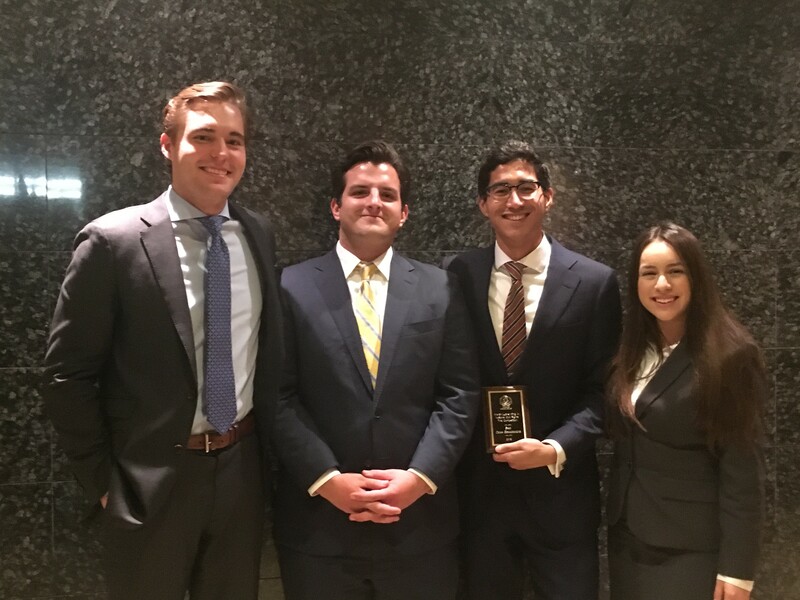 UT Law’s team was one of the only teams to receive full damages from the judges during the arbitration round and placed third overall in the mediation round. In Vino Veritas Mock Trial Competition hosted by Golden Gate University in San Francisco, CA. Team Members: Gabriel Culver, Benjamin Hartman, Joseph Minton, Basma Raza and Samantha Sandfort (all third-year students). Federal White Collar Crime Invitational hosted by the Georgetown University Law Center in Washington, DC. 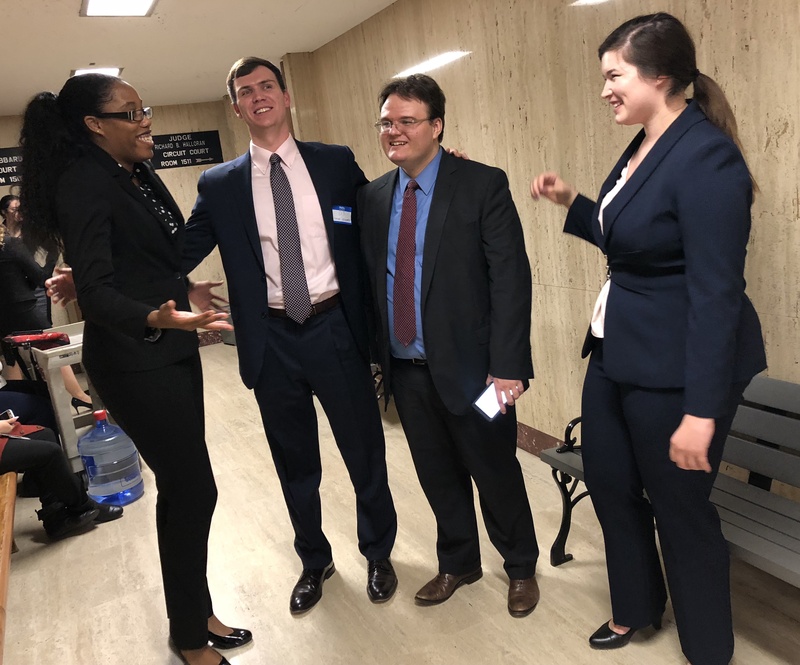 19th Annual National Trial Advocacy Competition (NTAC) hosted by the State Bar of Michigan Young Lawyers’ Section. The competition took place in Detroit, Michigan. Individual Awards: Payne Keinarth received the competition’s Professional Ethics Award.